On October 29, 1929, life in the United States took a turn for the worst. The stock market – the system that controls money in America – plunged to a record low. But this event was only the beginning of many bad years to come. By the early 1930s, one out of three people was not working. People lost their jobs, their houses, or both and ended up in shantytowns called “Hoovervilles” named for the president at the time of the crash. By 1933, many banks had gone under. 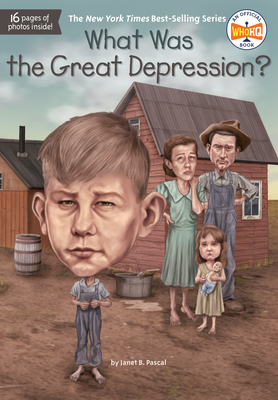 Though the U.S. has seen other times of struggle, the Great Depression remains one of the hardest and most widespread tragedies in American history. Now it is represented clearly and with 80 illustrations in our What Was…? series. Janet Pascal is an Executive Production Editor at Viking Children's Books and the author of Who Was Dr. Seuss?, Who Was Maurice Sendak?, and Who Was Abraham Lincoln? She lives in New York City.